Clear your calendar for March 2nd because you just made plans! Elevent Productions, Third Shift Amber Lager, and our friends over at East Nashville Underground and No Country for New Nashville have just announced a stacked bill for their South By Southwest send off show. The event will take up two of the three venues at 1 Cannery Row, taking place at Mercy Lounge and The High Watt. 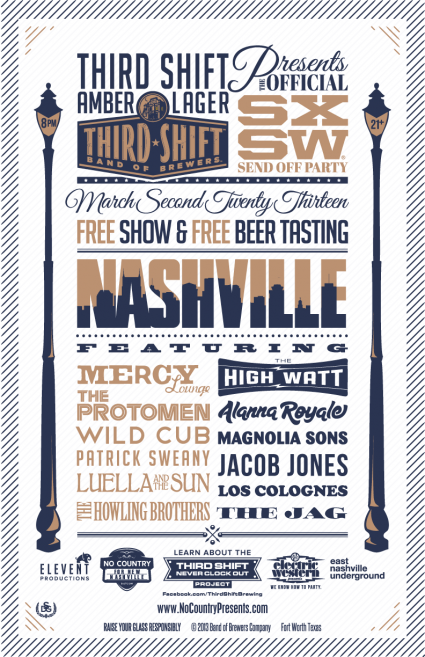 The Mercy Lounge stage will highlight some of Nashville's best and brightest on the road to Austin's renowned music conference, and in addition to the fantastic lineup, Third Shift will be providing a free beer tasting. The festivities start at 8 pm. The Mercy Lounge stage will host The Protomen, Wild Cub, Patrick Sweany, Luella and the Sun, and The Howling Brothers. Over at the High Watt, you've got Alanna Royale, Magnolia Sons, Jacob Jones, Los Colognes, and The Jag. More information on the event is over at No Country for New Nashville.